I was completely exhausted by the previous day’s exertions and should have slept well. However, I kept waking up all night thinking about the six hour swim. We were expecting a “recovery” day and were planning to take a boat over to Comino island and spend the day relaxing. However, over breakfast the guides took a phone call from the boat pilot who said that the sea was too rough. The guides arranged for the minibus to take us to Dweirja and Gozo’s capital, Victoria, to do some sightseeing. So, we were proper tourists for the day! Here are some pictures, which show some of Gozo’s spectacular scenery and also help to explain why we couldn’t swim on Wednesday. In the evening, the group and our guides gathered for our final dinner. We had “Gozo Night” and it was a feast of local specialities. I have never seen so much food for 20 people. I particularly enjoyed the octopus, swordfish and the creme brulee. At the end of dinner Freda presented us with our certificates. I shall treasure my six hour certificate. I know that there will be plenty more six hour swims in Dover over the coming months, but the first one will always be special. This was our final day. 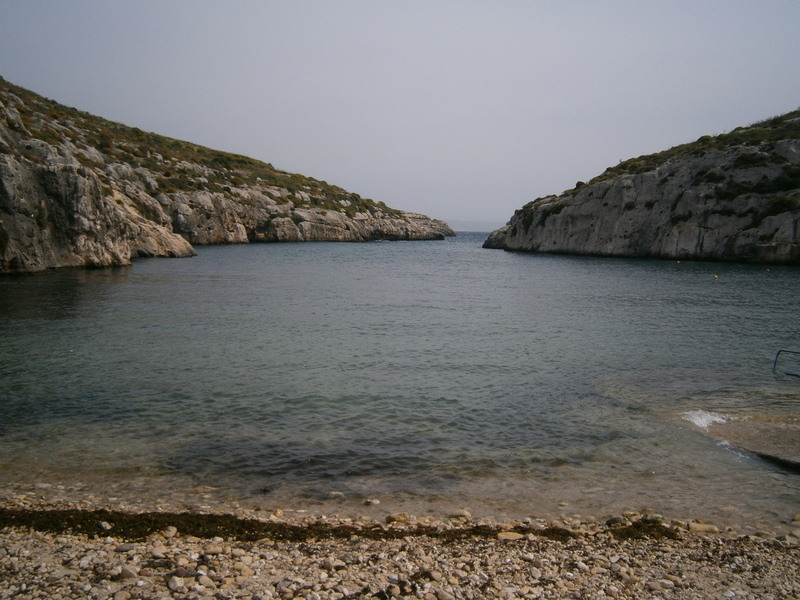 We were hoping to swim in Xlendi Bay, but again it was too rough and the jellyfish were there in abundance. We had a relaxing morning, which included a visit to the local ice cream parlour (double scoop with a chocolate cone!) and a visit to the beachfront cafe. At midday we bade our farewells and headed off to the airport. I would definitely recommend the Swimtrek Long Distance Training tour to anyone who is planning a marathon swim. We did a lot of swimming over the three swimmable days and all the swimmers met or exceeded their own personal goals for the trip. Personally, I found the seminars and discussions with the Swimtrek guides, Freda and the other swimmers to be the most valuable aspect of the tour. I picked up so many useful tips which would otherwise have taken me months to accumulate – this knowledge will stand me in good stead for the summer. Dover Harbour training starts on Saturday 28th April. The water is currently 9 degrees – I can’t wait!! The day didn’t start too well – I went for breakfast and managed 3/4 of a slice of toast because my mouth was so sore. At breakfast we were told by the guides to meet downstairs at 9:30am. There was a change of plan and we were actually going to swim in Xlendi Bay. We all expected the six hour swim today, and this was confirmed at 9:50am. 3/4 of a slice of toast did not seem ideal preparation! Today was so different to the previous two days. I had decided that I was doing six hours and that was that! Basically, my mind was in the right place today and I was completely focused on the job in hand. We started at 10am, and the first thought was that it felt so cold! It felt much colder than Mgarr-ix-Xini bay. The first hour went well, I took my feed quickly and set off again. The second hour went fairly well, until I received my first jellyfish sting. I was starting to feel really cold, and after 1 hour 40 mins I asked for something to warm me up, and was given another feed. This seemed to work, I was swimming well, and came in for another feed about 40 minutes later. At this point I was really enjoying my swim. I felt good, and I only had 3 hours 40 minutes to go. Then disaster struck – I was stung by another jellyfish, but this one really hurt. It was a different type of jellyfish and it felt like my entire right arm and shoulder was on fire. By the time I got to the beach end of the bay I felt really sick. And then I was violently sick several times. I could be heard all across the bay! I was given words of encouragement, some warm water to drink and a jelly baby, and off I swam. This cycle then continued for the rest of the six hours – sick, swim, feed, swim, sick, swim, feed, swim, sick etc! I did feel a bit sorry for the poor people trying to enjoy their lunch on the beachfront. At no point did I ever consider getting out of the water. Every time I was sick, I immediately felt much better. I was still swimming well and wasn’t feeling too cold, so there was no need to get out of the water and no-one suggested at any point that I should get out either. At about 3 hours the jellyfish were moving into the bay en masse and everyone was getting stung. I was swimming breaststroke at the far end because there were so many jellies and I was trying to avoid them. The guides moved the outermost buoys closer into shore. The four hour feed was interesting as this one was taken from the boat rather than the beach. I felt that it was a quick feed and worked well (although it came back up within ten minutes!). The swim got much more interesting after 4 1/2 hours. The sky darkened, and this was followed by torrential rain. We could hear thunder in the background. I found out afterwards that if it had started lightning then we would have been pulled out of the swim. Interestingly, we all said afterwards that we enjoyed the storm. It added a new dimension to the swim, and gave us something to think about. The rain also seemed to flatten the water and it was quite stimulating to have the heavy rain falling on our backs. The downside was that there was a lot of run-off from the roads and pavements into the area where we were swimming, and swimming through this was not pleasant. At five hours we were asked to stay at the beach end for the last hour. The jellyfish had moved right into the bay and everyone was getting stung. (Afterwards I was shown pictures of the buckets of jellyfish which the guides had caught – good job I didn’t see them beforehand!). Eventually the six hours was up. It is a bit of a blur, but I counted 4 jellyfish stings, 14 occasions of being sick plus one storm! I felt I could have stayed in for much longer – I realised that all of the issues were manageable, and apart from the sickness, I felt perfectly fine! I exited the water to plenty of congratulations, and a comment from one of the guides: “Well done, that was brutal Zoe!”. I was certainly had a lot of obstacles thrown at me during the swim, but I got there, and felt a real sense of achievement afterwards. The lesson I learnt today was that the mind plays a huge part in this game. I was so focused today. I also learnt that I am highly accomplished at treading water and being sick!! Well done to all the swimmers who completed the six hour swim: Neil, Stephanie, Kate, Maighread, Anna, Lynsey, Becky and myself. Even more congratulations to Yves from Swimtrek, who got in at the start to see what he could do and he actually completed the six hour swim! In the evening we ate at The Boat House again. We had plenty of time to reflect and discuss the day’s swimming.We had bruschetta and bread to begin. I then had a local Gozitan speciality, Rabbit’s Liver, for starter. This was followed with a fillet steak. Finally, I had strawberry ice cream which was lovely and cooling on my sore mouth. So, I’ve completed my six hour “qualification” swim now, which means that I can swim the English Channel in July. There will be plenty more 6+ hour training swims in Dover over the coming weeks, but hopefully none as horrible as this one! Here’s a photograph of me receiving my six hour certificate from Freda Streeter. 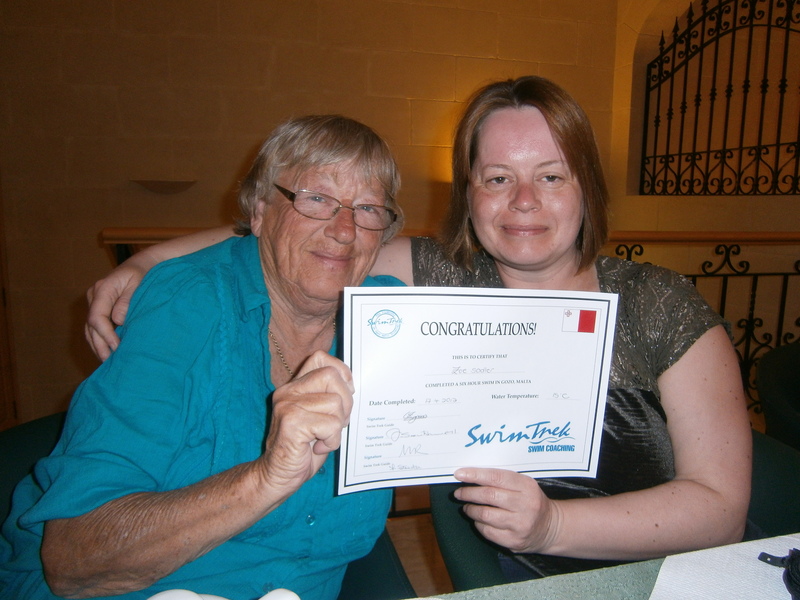 I attended the Swimtrek Long Distance Training Camp in Gozo and completed my six hour swim on Tuesday 17th April. This means that I have now completed the formalities in order for me to fully register my Channel swim! I arrived at the Hotel San Andrea, Xlendi in Gozo at around 6pm. The “holiday” started with a meal for the entire group in the hotel’s own restaurant, Zafiro. I had an excellent meal of Parma Ham with Melon, Swordfish followed by Tiramisu. This was a sign of things to come – the entire 6 days was spent either pigging out, swimming or resting! At the meal, I met the other 14 people booked on the trip, along with the Swimtrek guides (Mia, Chris, Fiona and Yves). 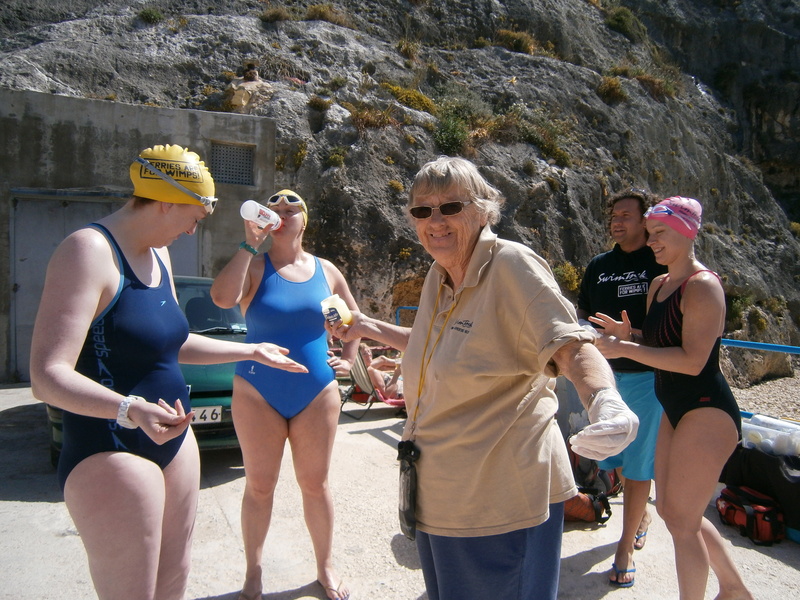 Our special guest for the trip was the legendary Channel swimmers’ coach and advisor, Freda Streeter. Her daughter Alison Streeter is the “Queen of the Channel” having swum the English Channel 43 times. Her son, Neil, will be my pilot in July. The day started with breakfast at 7:30 and we were asked to meet at 8:30 for our first seminar. We all introduced ourselves to the rest of the group, explained our swim histories and our challenges. I was amazed by the diverse group of people, each with their own different but amazing stories. Then I realised I was one of them too! In the group we had two swimmers who had already swum the English Channel. Of the group, 4 were planning to swim the English Channel this year (Becky 2-way, Neil, Stephanie and myself) and others were planning to swim it next year. Anna, who has already swum the English Channel and the Gibraltar Straits, is intending to swim around 5 islands (Dragonera, Portsea, Jersey, Isle of Wight and Tiree). We were told to meet downstairs at 10am and to bring at least 2 swimming costumes. The bay at Xlendi was full of jellyfish, so we took a minibus to Mgarr-ix-Xini, about 20 minutes away. We were told to get ready and we were going in for an hour. So, in we all got. It felt cold – but I had only been in the sea twice so far this year, so that wasn’t really a surprise! After circling the bay for an hour, I swam to the beach to get out and was told, “Take a quick feed, you’re all doing another hour”. I chuckled to myself as I had been expecting them to play some mind games with us and thought this was just the beginning! I necked my Maxim, and carried on swimming. At the end of 2 hours I swam to the edge and was told to get dried and grab some lunch. I admit to being very surprised there, I had expected another hour at least! This is where it started to go wrong. We were told to “eat well”. And I did! The picnic was fantastic and I ate and ate and ate! Pasta, bread, cheese, crisps, salad, nuts, tuna, chocolate. I was well and truly stuffed! Then 20 minutes after stuffing myself silly, we were told “Get ready to start swimming in 10 minutes”. Oh dear! There were a couple of protests about swimming on full stomachs, but we were going in. Anyway, I swam for an hour, but I remember feeling absolutely awful and really sick for the entire hour. It was not a good swim. In addition to the sickness, the jellyfish had moved into the bay and were really distracting my rhythm as I kept stopping to avoid them. The hour felt longer than the earlier 2 hour swim! I learnt a lesson – don’t stuff yourself silly if you might be swimming later! We returned to the hotel and then had a seminar on mental preparation and stroke analysis. The video of me swimming was actually quite good! The only thing that I should change is my feet, which come out of the water when I kick, and I obviously do not need the extra drag on a long swim. We then went for dinner at Ta Karolina. We were given complimentary bruschetta and various platters before our meals came. 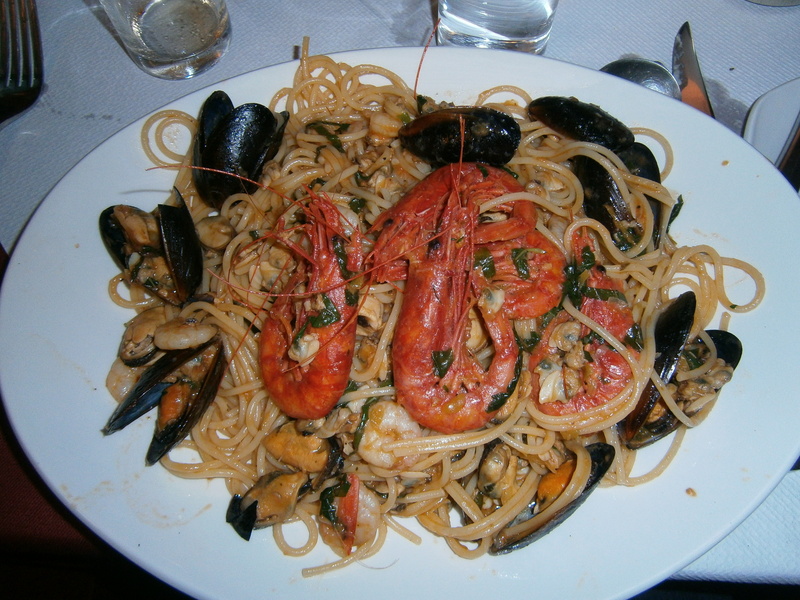 I had brie to start, followed by Spaghetti alla frutti de mer. I had no room for pudding. These pictures might explain why! After breakfast we met downstairs for the minibus and we headed off to Mgarr-ix-Xini bay again. Once we were changed and assembled for the briefing, we were told that we were going in for three hours with feeds each hour. The first hour went well. I was swimming pretty well, although I was getting spooked by the jellyfish again. I went in for a feed, and was quick to drink my Maxim and eat my Milky Way. I set off again, but about 20 minutes later I started to get chest pains. I shouted over to the support boat that I had these pains and I was told to “swim in”. I thought that meant I had to get out! I swam to the beach to be met by Freda, who suggested it was indigestion, and I was told to stay down by the beach and to swim between the buoys down at the beach end of the bay. It was calmer there, so I was quite happy to do this – besides there were a lot of different fish to look at! However, after about 20 minutes of this I was really bored, so I said I was going back out around the bay again. I came in for my 2 hour feed, and headed out for the final hour. It was getting really choppy by then and out at the far end of the bay I felt really sick! Today wasn’t going right at all – I swam back to the beach to ask for some water and was told by Jessica to swim to the buoy and back, and then they would take me out. When I got back to the beach I was all ready to get out. Freda was waiting for me there and told me to stay down the beach end of the bay and keep swimming. I wasn’t getting out at all! The next 30 minutes were really boring and I got out at the end of the 3 hours, really disappointed with myself. 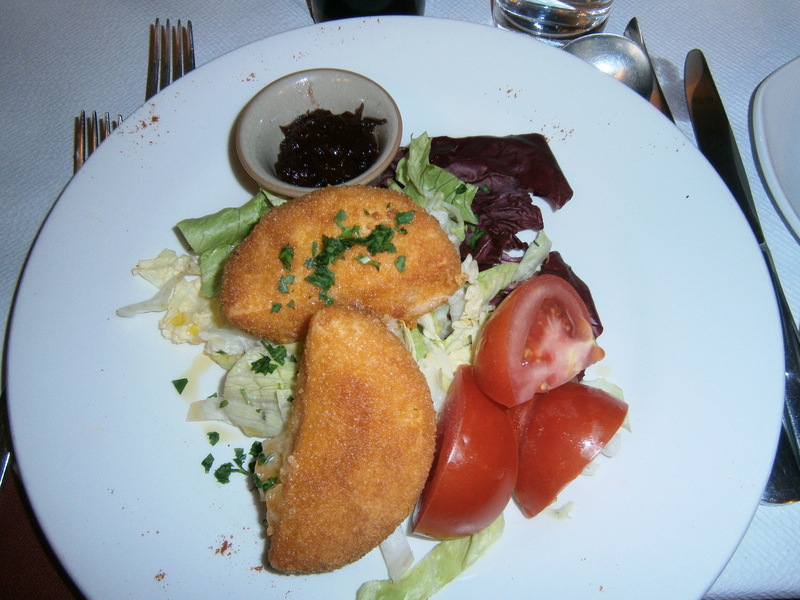 Lunch was then served – I remembered the previous day’s mistakes and didn’t eat half as much. Then I fell asleep on the concrete…. I was woken up with the ten minute warning that we were going back in for two hours. I don’t really remember much about the two hour swim, other than feeling really tired and moaning every time I went for a feed or a drink. The jellyfish had also moved right into the bay, so I was distracted by them and by the very choppy sea. At the end of the two hours, I got out, really quite despondent with my swim, and wondering what I was doing there. I also realised how hard the support crews have to work to keep the swimmers in the water. We went back to the hotel and we had another seminar on mental preparation. I think I needed that – it gave me a lot of food for thought. Speaking of food, we went to The Boat House restaurant for dinner, where I ordered Beef Timballe for starters followed by the Boat House Calamari (a house speciality). Before our meal arrived they brought out complimentary bruschetta and bread. I was full before the starter came out! All of the food was absolutely delicious, but I struggled to eat the calamari because it was served with a sauce, containing chilli! Eight hours of swimming in salt water had blistered my tongue and I could not eat this wonderful food. In hindsight I wasn’t mentally prepared for the swims today- another very useful lesson! Physically I was coping fine, but my mind was sabotaging the swims. Originally I was going to keep fairly quiet about my challenge to swim the English Channel in 2012 but on reflection I realised that was very non-committal of me! I realised that there were a number of advantages to telling people about my plans. A few people sniggered and told me it was a stupid idea, but the vast majority of people have been extremely supportive of my plan. I have chosen to ignore the minority! I have been told that in order to succeed I need to understand that the challenge is 90% mental and 10% physical. I honestly do believe that is the case and that is why I refuse to use the word “attempt” in relation to my swim. I am 100% positive in my mind that I will swim the English Channel in July 2012 – I just need to do a lot of training before the big day! I have already completed the vast majority of my official paperwork. I have registered my swim with the Channel Swimming & Piloting Federation. http://www.cspf.co.uk/ I passed my medical with flying colours and I have paid the final deposit on my pilot boat. I still have the small matter of completing the 6 hour qualification swim in water of 16C or less, but I am am doing that later this month. So it really is all systems go! *I have to be ready to go at any point in this tidal period. There is always the possibility that the tide could be blown out completely due to adverse weather conditions, but we don’t think about that! I’m intending to use this blog to record the run up to my swim, including my training highs and lows.